The Worrall Covered Bridge, located a few miles from Rockingham, Vermont, is a lattice style bridge spanning 87 feet over the Williams River. 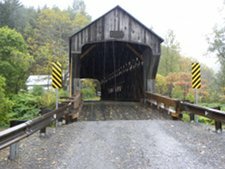 Originally built in 1868, the bridge was considered in need of repair in 2008 by the National Covered Bridge Preservation Project. After receiving federal funds for improvements and repairs, the bridge received many upgrades including increased fire retardation, replacement of timbers, structural preservation and a new bridge approach. In May of 2010, Portland Bolt supplied custom galvanized carriage bolts, timber bolts, hex bolts, threaded rods and plates that would be used in the new approach span. All of the bolts were domestically manufactured in house from start to finish, including the forging of the heads, threading and hot-dip galvanizing.